A Denmark zoo that earned international condemnation for killing a healthy giraffe last month has euthanized four African lions. The Copenhagen Zoo put down a 16-year-old male lion, a 14-year-old lioness, and two young lions this week to make way for a new male lion from the Givskud Zoo, also in Denmark. "The change in the lion pride had to happen now because Copenhagen Zoo currently has two young females from the 2012 litter and it is ideal to keep these as part of the new pride and then find a suitable male," the zoo wrote in a Wednesday statement on its website. "If the Zoo had not made the change in the pride now then we would have risked that the old male would mate with these two females—his own offspring—and thereby give rise to inbreeding," the statement says. What's more, the 14-year-old lioness was too old to give birth and raise another litter without complications, the zoo said. The news quickly reverberated across the globe, with 10,000 stories as of Wednesday and Twitter abuzz with people expressing shock and disgust. But the European Association of Zoos and Aquaria (EAZA) noted in a statement that the Copenhagen Zoo "has not broken any of its codes of conduct." Still, by Wednesday morning, 49,000 people had signed a petition on the environmental advocacy website Care2.org entitled "Tell Copenhagen Zoo to Stop Killing Healthy Animals!" 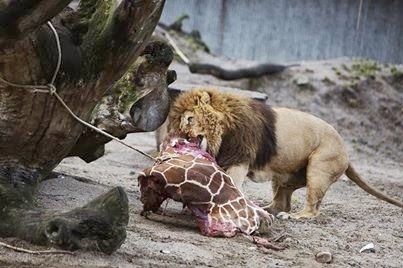 The Copenhagen Zoo's killing and public dismemberment last month of a healthy giraffe that the facility had named Marius also sparked outrage on social media. The news even prompted death threats against zoo staff, and was seen by some animal lovers as a provocative response to a campaign to spare the giraffe's life in the days and hours leading up to his death. "When breeding success increases it is sometimes necessary to euthanize," Bengt Holst, Copenhagen Zoo's scientific director, said in a February 9 statement on their giraffe's death.